This example override onOptionsItemSelected() method to handle user click on Options Menu in ActionBarCompat. Modify MainActivity.java in last exercise "Add MenuItem to ActionBarCompat using Java", override onOptionsItemSelected(). Get the id of the clicked menu item by calling item.getItemId(), then compare with the id(s) defined. 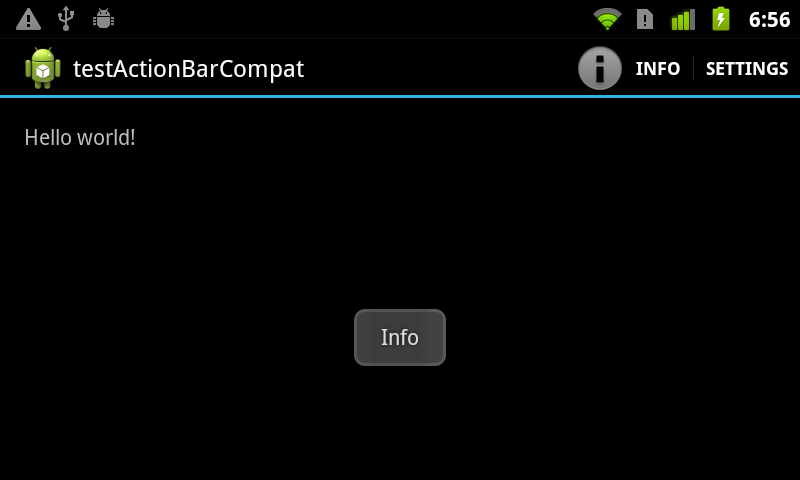 We are going to add MenuItem, menuItem_Info, to ActionBarCompat using Java code. 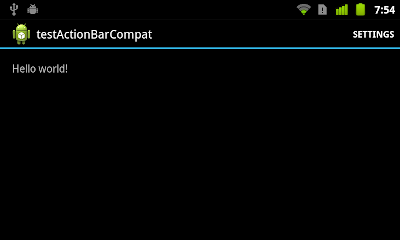 Modify exercise from last exercise "Example of using ActionBarCompat with android-support-v7-appcompat". 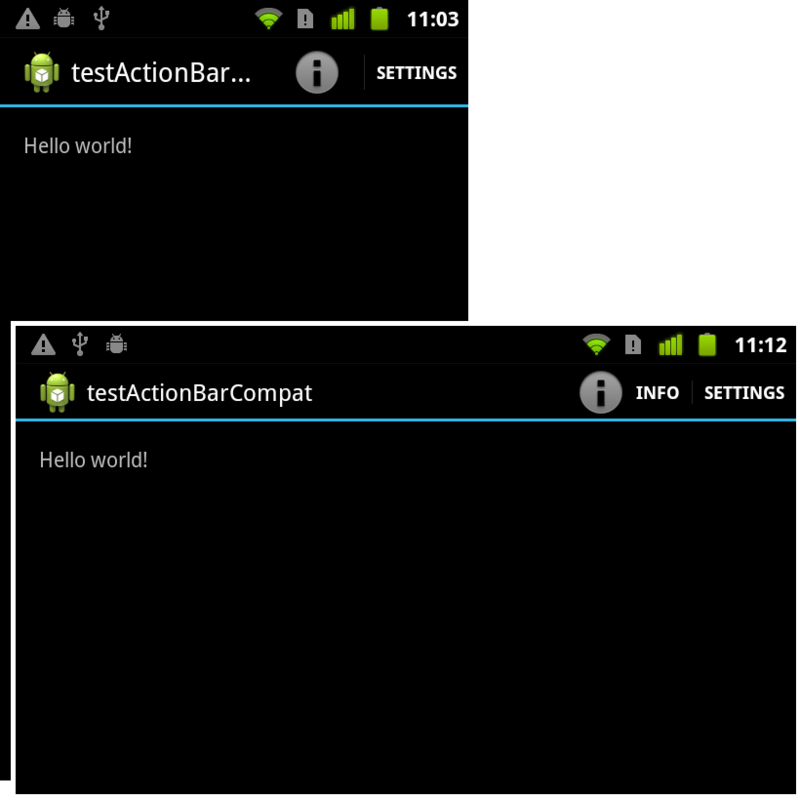 This exercise show the steps to modify the auto-generated "Hello World" by Android ADT/Eclipse, to implement ActionBarCompat, with backward-compatible Action Bar back to Android 2.1. 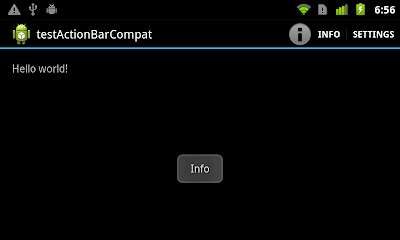 - Before start our new project, you have to "Create library project with the appcompat v7 support library". 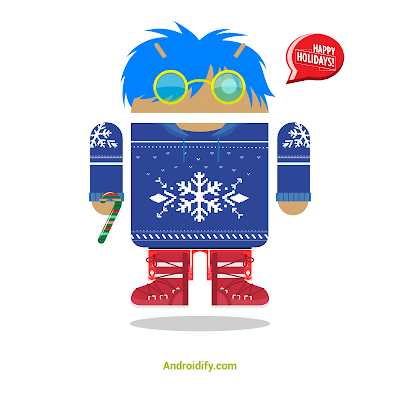 - New a Android Application Project as normal. 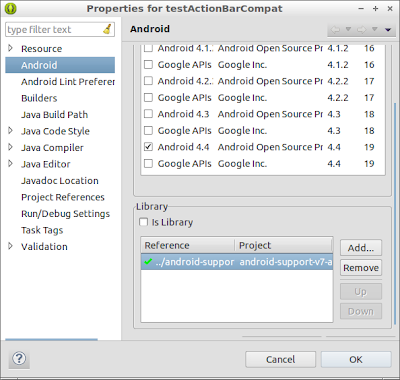 - Right click on the project, select Properties, select Android tab on the left box, scroll down on the right to make sure the check box of "is Library" is un-checked, and click the Add button to add library of "android-support-v7-appcompat". then click OK.
- Modify AndroidManifest.xml, change android:theme inside to "@style/Theme.AppCompat". And make sure android:minSdkVersion is equal or higher than 7, Android 2.1. - Modify menu resources file, /res/menu/main.xml. Add a new xmlns, xmlns:myapp="http://schemas.android.com/apk/res-auto". You can choice any name (myapp in my example) you want. But it has to be matched with the name space in . 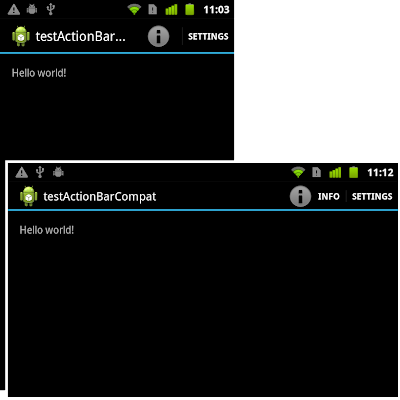 - Modify MainActivity to extend ActionBarActivity with android.support.v7.app.ActionBarActivity imported. 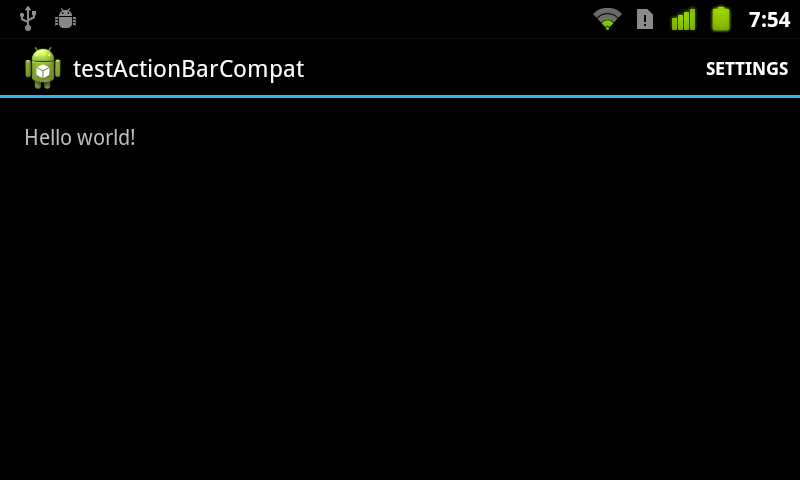 - Now it can be re-build to generate app with Action Bar running on devices of Android 2.1 or higher. Together with the release of Qt 5.2, the Qt Mobile edition is now available for you to download and try: http://qt.digia.com/qtmobile. This video shows how easy it is to get started developing for iOS and Android using Qt Mobile with Qt 5.2. This is done by creating a simple "Hello World" application showing how it can be launched on the official Android and iOS simulators as well as real Android and iOS devices. Make your web applications usable, responsive, and accessible. Google are announcing the open-source release of LiquidFun, a new C++ 2D physics library that makes it easier for developers to add realistic physics to their games. Based on Box2D, LiquidFun features particle-based fluid simulation. Game developers can use it for new game mechanics and add realistic physics to game play. Designers can use the library to create beautiful fluid interactive experiences. The video clip below shows a circular body falling into a viscous fluid using LiquidFun. The LiquidFun library is written in C++, so any platform that has a C++ compiler can benefit from it. To help with this, Google have provided a method to build the LiquidFun library, example applications, and unit tests for Android, Linux, OSX and Windows.